Make beats in virtual reality, a reality ? We hear about it more and more, virtual reality is there and we must start talking about sound ! But what is virtual reality exactly ? Virtual reality or virtual realities (VR), which can be referred to as immersive multimedia or computer-simulated reality, replicates an environment that simulates a physical presence in places in the real world or an imagined world, allowing the user to interact in that world. Virtual realities artificially create sensory experiences, which can include sight, hearing, touch, and smell. Most up-to-date virtual realities are displayed either on a computer screen or with special stereoscopic displays, and some simulations include additional sensory information and focus on real sound through speakers or headphones targeted towards VR users. Some advanced haptic systems now include tactile information, generally known as force feedback in medical, gaming and military applications. Furthermore, virtual reality covers remote communication environments which provide virtual presence of users with the concepts of telepresence and telexistence or a virtual artifact (VA) either through the use of standard input devices such as a keyboard and mouse, or through multimodal devices such as a wired glove or omnidirectional treadmills. The simulated environment can be similar to the real world in order to create a lifelike experience—for example, in simulations for pilot or combat training—or it can differ significantly from reality, such as in VR games. As of now, what we experienced of virtual reality has a lot to do with the gaming market. A huge market where sound is of a crucial importance for the final user enjoyment. Virtual reality is today the most accomplished multimedia experience unifying both arts (sound, video, design,…) and sciences (computer technologies, programming, …). But sound only had a shy presence in all the discussions going on on various forums and websites or even in TV presentations. In a virtual reality context, we’re not talking about stereo sound but about surround sound, we’re not anymore hearing the music… We must see the music and interact with it. Artists and programmers already involved in development of virtual reality projects must have exciting discussions on where the limits are ? What is possible and what is not ? And if someone from the other side of the planet is connected to my world, we can compose together ? It’s very promising for the future. 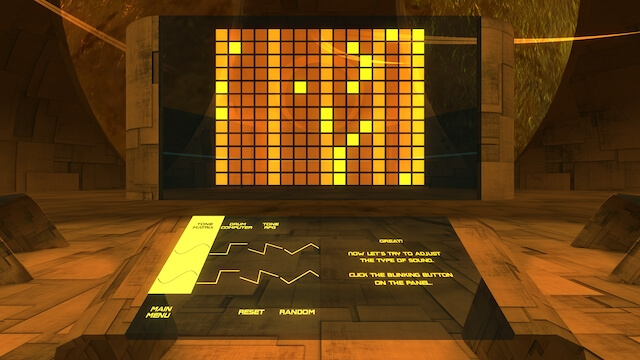 On huge screens, users can add musical notes, change effects and influence the characteristics of one of three instruments. Users can either do this solo or by jamming along with two other randomly-selected people. A seated experience, users input sounds via gaze tracking and clicking on the tracker on the side of the Gear VR. Does this helps to make better music ? No, but it completely redefine how we think about music. Maybe virtual reality will offer the necessary technology for artists to invent their very own world in which the music would deliver to the listener all of its subtle message.